I’ve made Nori rolls before and blogged about them, but I thought I’d like to try at least one or two other recipes for the ‘rice’ part of the Nori Rolls. I was really pleased with this recipe (and also put together my own dipping sauce which worked really well). These are such a quick and easy lunch time recipe. Place the nuts, cauliflower, salt and Nama Shoyu in a food processor and pulse until the mixture looks like sticky rice; it shouldn’t be smooth and needs to stick together a bit. Place a sheet of nori on bench and spread 1/3 of the cauliflower mixture down middle. 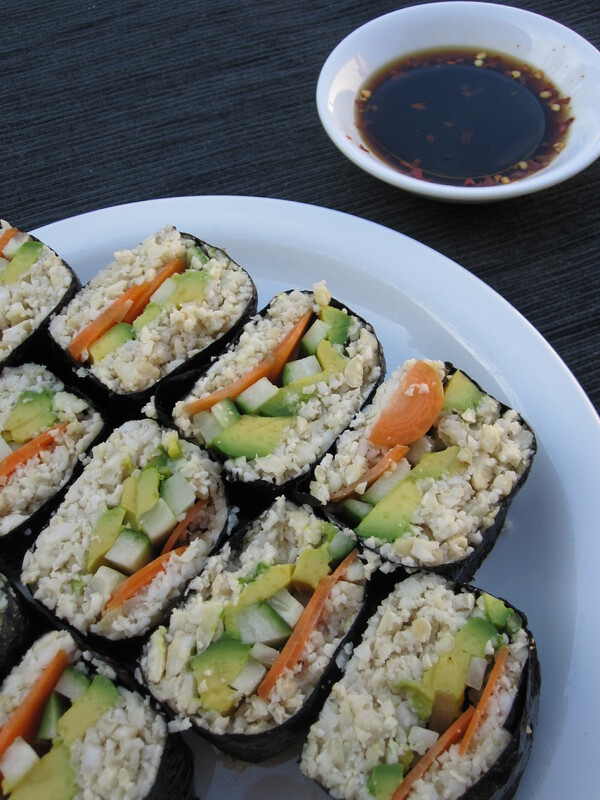 Arrange some avocado, carrot and cucumber on top of the cauliflower. Roll up the nori and moisten the last inch with water to seal the roll. Set roll aside with the sealed side down on the bench. Continue with the remaining nori, cauliflower and vegtables. Slice each roll into six pieces. Put the rolls cut side up in a serving plate. Serve with some Nama Shoyu or my dipping sauce. I find that the raw Nori is a bit ‘chewy’ so they kind of fall apart when you dip and eat them. Larger pieces would probably work better.